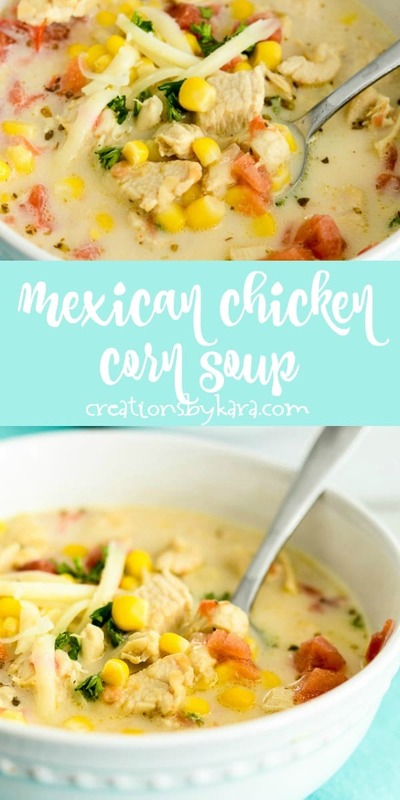 Mexican Chicken Corn Soup takes only minutes to prepare, and is so yummy! 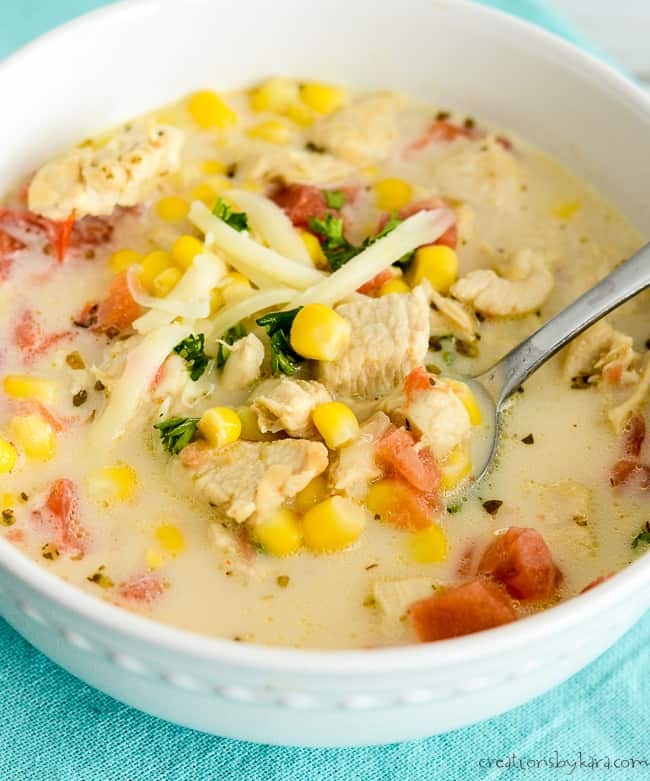 It’s loaded with chicken, corn, tomatoes, green chilies, and plenty of Mexican spices. 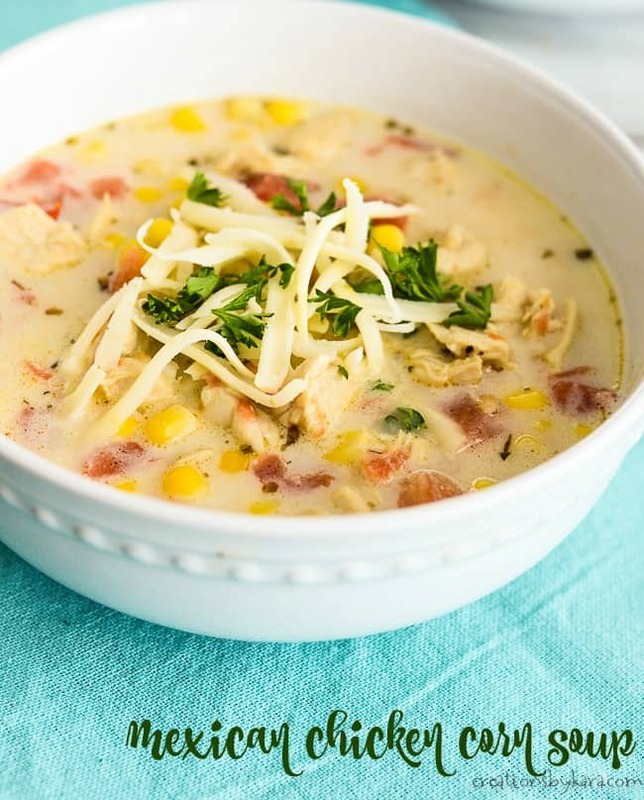 We love soup with a Mexican flair! 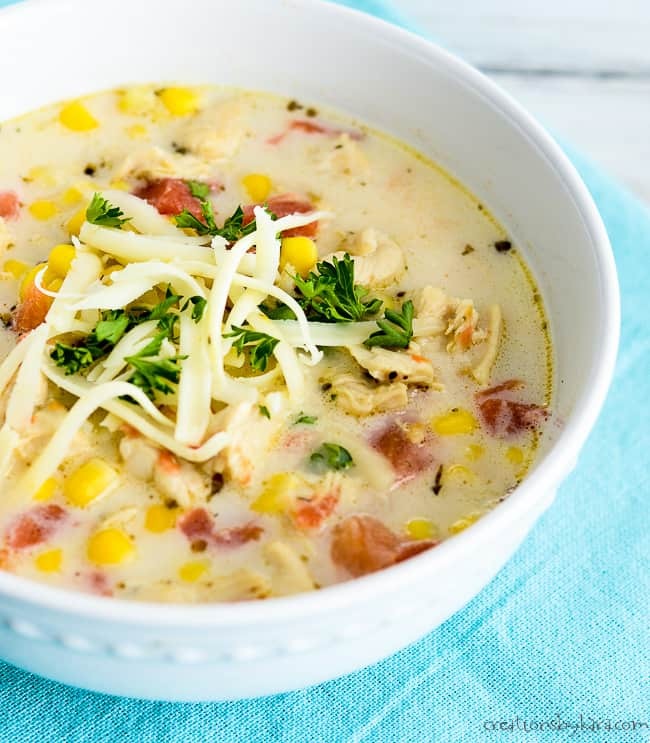 Easy Nacho Soup, Instant Pot Chicken Tortilla Soup, and Mexican Chicken Chili are a few more of our favorites. This soup is hearty, and the flavor is fantastic. Sweet corn balances out some of the spice in the soup. Oh so good. My kids like to top their bowls with tortilla chips, and they love it when I serve it with breadsticks or cornbread. Definitely a new family favorite, I’ve made it three times already! Don’t be put off by the long list of ingredients in this soup. After browning the chicken, it is just a dump and go soup recipe. Seriously, so easy to make! Also, there is no thickening in the soup, so it is naturally gluten free. Brown chicken breasts in oil in a large soup pot. Remove from pot and set aside. Add butter and garlic and saute for 2-3 minutes. Add chicken broth, tomatoes, frozen corn and all the seasonings. Return chicken to the pot. Bring to a boil. Reduce to a low simmer. Cook for 10-15 minutes or till chicken is cooked through. Remove chicken, shred, and return to pot with the heavy cream. Heat through. -To save even more time, you can use a rotisserie chicken (shredded) instead of browning the chicken breasts. If you do this, just add the shredded chicken at the end with the cream. -You can adjust the heat by using mild or hot Rotel, and using more or less cayenne pepper. We like it with pepper jack cheese, but colby jack or mozzarella have less heat, so they are a great option for younger kids. 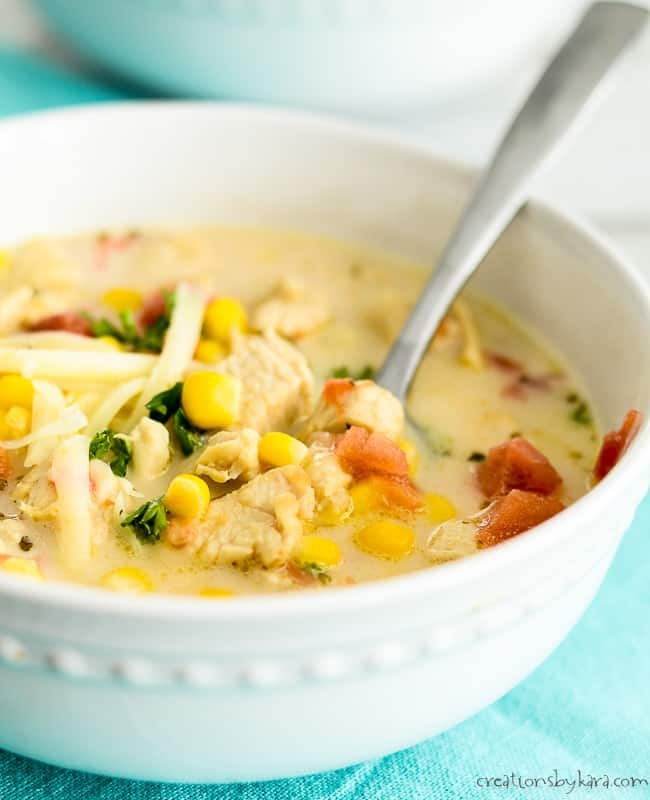 Hearty soup with chicken, corn, and plenty of Mexican flavor! Brown chicken breasts in oil in a large soup pot. Remove from pot and set aside. Add butter and garlic to the pot. Saute for 2-3 minutes. Add chicken broth, tomatoes, frozen corn and all the seasonings. Return chicken to the pot. Bring to a boil. Reduce to a low simmer. Cook for 10-15 minutes or till chicken is cooked through. Remove chicken, shred, and return to pot with the heavy cream. Heat through. -You can use mozzarella or colby jack cheese if you prefer. -Recipe inspired by Lil' Luna. To see all my soup recipes, click HERE. Could I do this in the crockpot? I think it would work just fine in a crock pot, just add the cream at the end a few minutes before serving. Let me know how it turns out! I too would love to make this soup but alas there are no amounts for the ingredients. 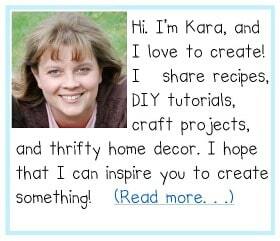 My site had a glitch and my recipe cards all disappeared for several hours. Yikes! You should be able to see it now. I don’t see the amounts on the ingredients. I’d like to try it but need to know how much of each ingredient I need. For some reason the recipe card disappeared, but it is back again. Sorry about that! This looks delicious!! I love soups, especially this rainy week! I love all the ingredients in this! Yum! Some of my favorite ingredients! Love a good soup recipe! Delicious! Definitely adding this to our dinner rotation. I hope it becomes a favorite at your house like it is at ours!